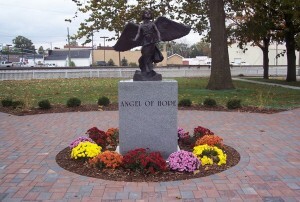 The Memorial was dedicated to the Village of Coal City, Illinois, on October 7, 2006, as a place for those suffering the loss of a child to honor the child’s memory. Located in Campbell Memorial Park , the highlight of the garden is an angel monument surrounded by walkways paved with bricks that can be purchased with a special message in memory of a deceased child of any age, from conception to adulthood. Bricks will be placed either in the spring and fall of each year, depending on demand, with the order deadline for spring placement on February 1 and for fall placement on August 1. 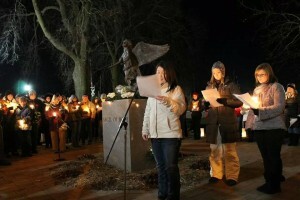 On December 6 – at 7 pm, each year, Angels of Hope, Inc., hosts a Candlelight Vigil to which the public is invited to leave a white flower at the base of the angel to honor the memory of a child of any age. It is our hope that the annual vigil will provide a place for grieving families to unite and find strength and comfort in one another. To help memorialize children that have been lost, Angels of Hope offers the purchase of engraved bricks to be placed in our Memorial Garden. Want to Order a Brick?